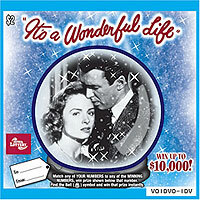 The classic Christmas movie, "It’s a Wonderful Life", featuring Denison native Donna Reed is now the focus of an Iowa Lottery scratch ticket and contest. The idea for the ticket came from Donna Reed Foundation boardmember Pat Fleshner after the lottery released a ticket honoring another Iowa actor. Fleshner says they were talking about the ticket featuring John Wayne, and talked about doing something to remember the 50th anniversary of the "Donna Reed Show." The John Wayne ticket was introduced in May to honor the 100th anniversary of the actor’s birth in Winterset. Fleshner says the discussion moved from Reed’s show to one of her most famous movie roles. She says it wasn’t going to work time wise to have a ticket for the Reed show anniversary, so she then asked about doing something tied to "It’s a Wonderful Life." Fleshner says she checked with Reed’s family members, and Reed’s daughter Mary Owen thought it would be "a neat idea." Reed plays Mary Bailey in the 1946 movie. She’s the wife of George Bailey, who was a man played by Jimmy Stewart who considers suicide during the holiday before being stopped by a guardian angel who shows him what things would have been like had he not been around. Fleshner says they’ve actually adopted the "It’s a Wonderful Life" theme. "The nice thing about is, for people who don’t even know Donna Reed, you can still feel it’s a wonderful life to live in Denison, Iowa, to live in Iowa, and that’s the way we feel," Fleshner says. Iowa Lottery spokesperson Mary Neubauer says the contest will try to find a couple to recreate the image of the Baileys. 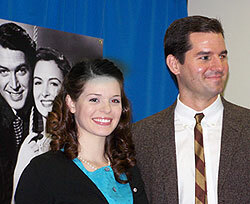 Neubauer says it’s not Donna Reed, Jimmy Stewart look-alike contest, it’s a George and Mary Bailey look-alike contest, and they will have three regional competitions around the state for a chance to win $500. Neubauer says the regional contests will be Friday December 5th at Merle Hay Mall in Des Moines; Saturday December 6th at Lindale Mall in Cedar Rapids, and Sunday December 7th at Southern Hills Mall in Sioux City. She says you’ll have to dress and look the part and give one of the lines from the classic movie for the judges. Neubauer says the final judging will take place on-line. The photos of the regional winners will be on the Iowa Lottery’s website from December 9th through the 18th, and the public will get to vote on the best George and Mary Bailey. The winners of the overall contest will each win $500. 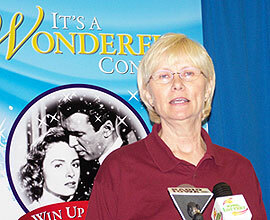 Neubauer says the Donna Reed Foundation will receive around $2,000 from the Lottery. The tickets are already on sale across the state. Neubauer says the John Wayne tickets sold out, and they are hoping for a similar result from the "It’s a Wonderful Life" tickets. Donna Reed was born in Denison in 1927 and left there at 16 to seek an acting career in Los Angeles. Reed died of Cancer in 1986.